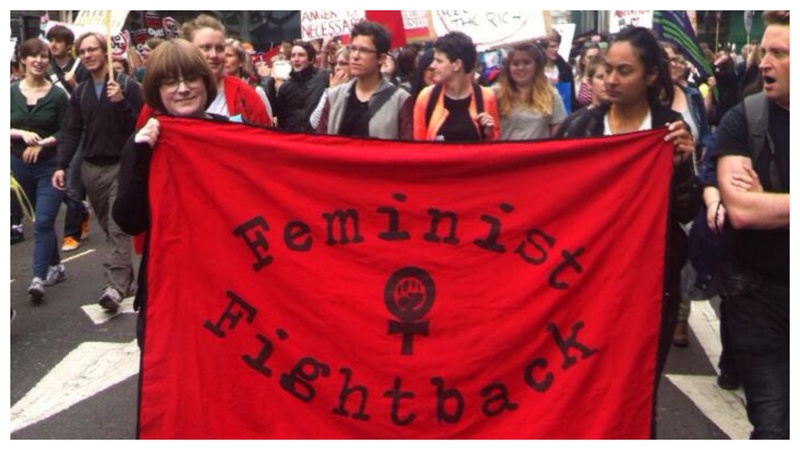 On 20th June 2015, Feminist Fightback, along with thousands of people, took part in anti-austerity demonstrations in UK cities. Since 2010 cutting public expenditure, and there public sector services (and benefits), has been the most common reaction to the crisis in Europe – as ordinary people are being made to pay for capital’s crisis. Research shows that cuts in public spending tend to have a disproportionate negative impact on women and thus undermine gender equality. Lay-offs and wage cuts in the public sector will have a big impact on women, because they constitute the majority of public sector employees. Cuts in services and benefits will be particularly felt by women, because women are more dependent on public services such as childcare than men, and because various benefits play a more important role in their overall income. In the UK it has been estimated that women are hit twice as hard by cuts in benefits. Similarly, the government’s benefit cuts are brutally hitting disabled people, and they too tend to be reliant on multiple public services. 85 per cent of disabled people say losing their disability living allowance will drive them into isolation, and leave them struggling to manage their condition. The cuts may be ideologically driven, but they are also messy and incoherent. And it is within these contradictions – working together across our identities as women, men, workers, public service users – that we may be able to carve out a different vision, instead of simply defending against savage attacks an imperfect liberal welfare state – one that is dependent on the exploitation of unwaged female labour. Feminist Fightback have grappling with the gendered effects of the benefit cuts even since our inception e.g. holding ‘Women at the Cutting Edge’ in 2010, authoring ‘Cuts are a feminist issue’ and being involved in the Save Hackney Nurseries Campaign.